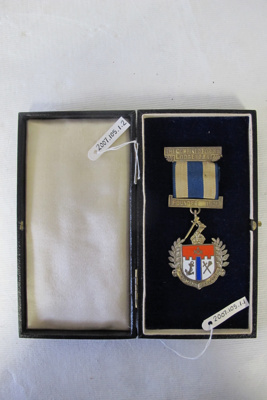 Combined Forces Lodge medal: enamelled shield with Masonic Symbol on red above anchor on white (left) sword crossed over mace on right surmounted by Crown and Arm brandishing sword. hung from blue and gold ribbon with "Combined Forces Lodge 284" on top bar. Founder 1925 on bottom bar. comes in a blue carrying box. no makers name.